Last week, The Age published a piece by its Economics Editor, Peter Martin, called Power down: What the Melbourne Cup can teach us about fighting climate change. It began with a pretty interesting observation about changes in electricity usage that happen as people down tools or computers or something and watch the Melbourne Cup. It wasn’t that long ago that I took the constancy of the electrical output at wall sockets for granted. Martin echos my own fascination at finding out a little of the black art, otherwise known as power engineering, that makes it happen. It’s not magic, people have to do stuff … sometimes on a minute by minute basis. Martin turns this into an energy efficiency rant by somehow imagining that we consumers can, by collective action, conquer climate change in the same way that US consumers crushed the oil crisis in the 1970s by switching to 4-cylinder cars and insulating their houses. What? Is that what really happened or did Martin just make it up or repeat something he heard in the pub from somebody who heard it from a mate who knows Amory Lovins? Let’s check. 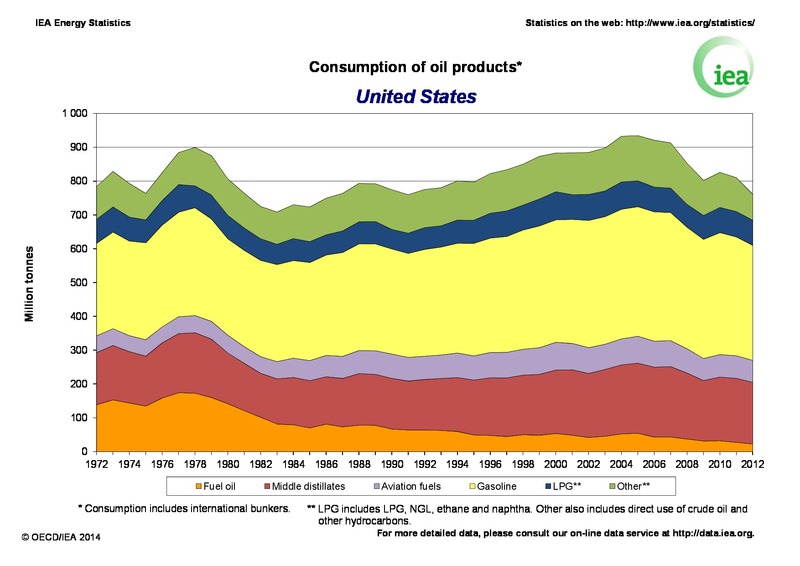 We can go to the International Energy Agency website and with a little hunting find a chart of US Oil use since 1972. Here it is. Just looking at it is instructive. The standout decline is down the bottom. Fuel oil. None of the others look to contribute much on their own. Fuel oil’s use peaked around 1978 and then crashed. Print the image and measure. It’s down by almost 11 millimeters over the following decade on my printout … close on 100 million tonnes. What’s Fuel Oil? It’s the stuff they used to use to generate electricity by running generators with it. Now look at gasoline. That’s the stuff people put in cars. Measure it in 1978 … 39 millimeters. Now measure it in 1988 … it’s close but we can round down to 38 millimeters. Maybe some Americans really did switch to smaller cars. In any event, this graph shows that they didn’t end the oil crisis. So what about the other prong of Martin’s claim … home insulation? “Fuel oil” does cover some home heating oil so it might have been a factor. Or perhaps whoever made up the claim about smaller cars being important just made this up too because some people did indeed insulate their homes and nobody bothered to check how big a deal that was. Let’s see. We can probably get a rough idea by checking if the 100 million tonne fuel oil reduction we know about was matched by an equivalent rise in electricity as the fuel oil use dropped. 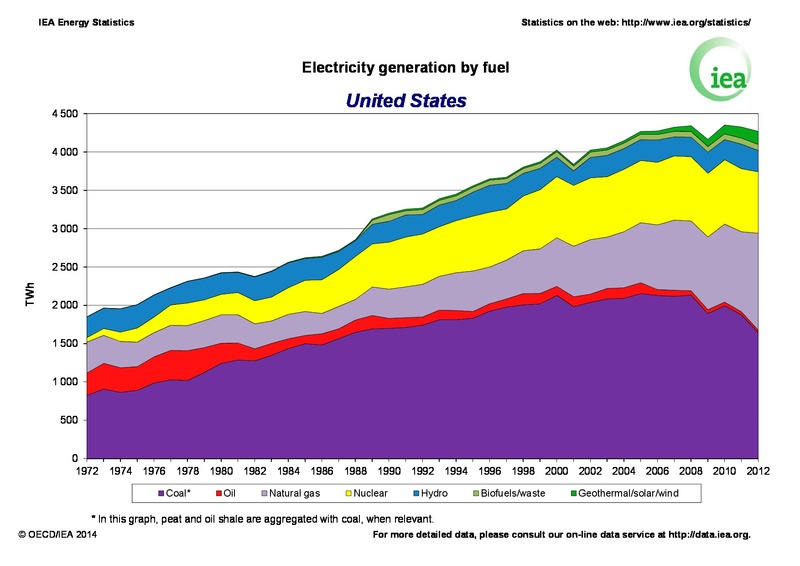 Here’s the graph of electricity by fuel for the US. There was a large increase in electricity generation in the US between 1978 and 1988. That’s clear and electricity from oil declined. But it’s still tricky to relate that decline in oil used for electricity with the oil used for residential heating. Lets find a more direct source of data. Perhaps someone can find better data, but all I have is a 2012 data point. In 2012, the US EIA says there were some 11 million tonnes of fuel oil used for residential heating. There are now 315 million people in the US compared to 220 million in 1977 and we have also had an big increase in new house sizes. So even if insulation halves oil use, it still couldn’t amount to a big chunk of that 100 million tonne reduction we have to account for. Did more people insulate their homes? Sure. Was it a big deal? Probably bigger than that Melbourne Cup decline in electricity of half a percent, or the couple of percent of electricity generated by Australia’s million solar panels … but not what I’d call big. So what did crush the oil crisis? The rapid growth of nuclear and coal. The rapid nuclear roll out wasn’t only in the US. It also happened in France, Germany, Belgium, UK, Sweden, Switzerland and Japan. And I probably missed a few. 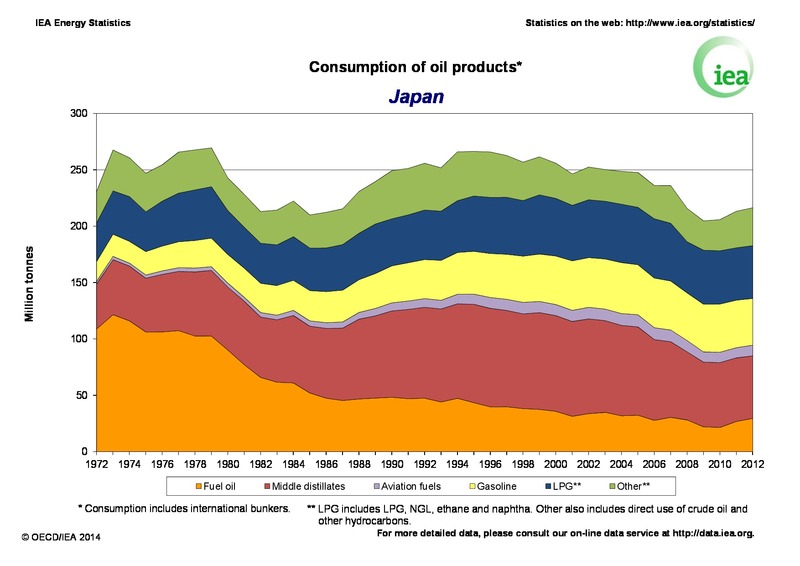 Here’s the oil use graph for Japan … look familiar? Pretty much the same, a big crash in fuel oil, except that the scale is different. Again it has nothing to do with cars or the collective wisdom of the nation’s motorists, they stopped using oil in big electricity generation plants. Along with nuclear, any country with coal also built as many coal fired power stations as they could. 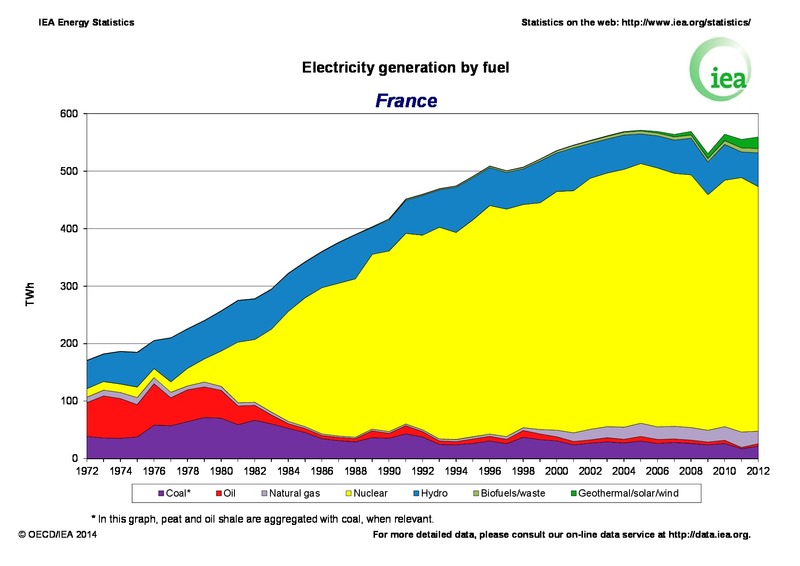 In France’s case they don’t have a lot of coal so the oil crisis crusher was just nuclear on it’s own. Here’s its graph … and it’s abundantly clear what displaced oil here. Again it wasn’t collective decisions it was a Government plan. Having reshaped history in a manner of his choosing, Martin then proceeds to argue that the recent decrease in household electricity usage since 2010 is somehow a model of how we can deal with climate change. Remember that Melbourne cup drop in electricity use? A half of one percent. Excuse me for not being blown away by this. The CSIRO Solar Intermittency” report reckons Photovoltaic output can drop 60 percent due to cloud cover in about 4 seconds. Now that’s a real drop! Can you imagine the panic in the control room as a cloud bank sweeps across a bank of large utility scale solar farms? So the current price signals, if continued, may well cause grid operators huge stability problems, and far bigger problems than the Melbourne cup, but will it fix climate change? Exactly what size change do we need to deal with our destabilising climate? More than 100 percent. Much more. Why? Because in Australia, for starters, electricity is far from being our largest climate impact … that’s still sheep and cattle, but a long way. Since my very first post on BNC with Barry Brook back in 2008, the climate scientists have raised their estimate of the impact of methane on warming substantially and it now stands at 105 … if you include all the indirect impacts. So each tonne of methane has an impact, before it is oxidised to CO2, similar to 105 tonnes of CO2. So since our livestock are still emitting roughly 3 million tonnes of methane, they alone have an impact equal to about 315 million tonnes of CO2. This 315 million tonnes is rather more than the 169 million tonnes of CO2 our coal fired power stations generate (according to our latest UNFCCC submission). Forgive me please, but I’m old fashioned. If you have a problem, then work out a solution and execute it. That’s how people all over the world solve big problems. Markets are quite good at solving some problems, but they have so far proven absolutely hopeless at reducing climate impacts. They have, of course, been quite good at shifting emissions from more than a few countries to China. The Montreal Protocol didn’t use market forces. It went for rapid phaseouts … it banned stuff. Banning stuff is a tough sell, but it works. Reducing methane emissions via reduced meat consumption would be great. I’ve reduced my meat consumption in 6 months by an order of magnitude, but occasionally I still eat meat. So there’s still some room for improvement. But despite this I find it hard to see how this could be changed on a scale of society. Banning stuff is a form of regulation and some groups of people are irrationally opposed to any kind of regulation. Banning fossil fuels would collapse society, so it should instead be done step by step by introducing replacements. But banning meat can be done much faster since it’s only behavioral change that’s needed. @ppp251: a phase out is just a ban done with appropriate care. You give people time to adjust, compensate as necessary, plenty of haggling, but it’s how we do stuff people care about. We no longer produce tobacco in this country … that was a phase out. We ban drink driving. We legislate and phase out all kinds of industries … asbestos panelling. The point is that it is a plan with a trajectory and a solution. It’s not, “Oh gosh lets put in some price signals and pray”. Jeffrey Sachs, in “The price of Civilisation” reflects on how we (the west) used to have a mixed economy … plenty of planning for the stuff that matters and a free market for the rest. But now any kind of planning for the big stuff is frowned upon and we’ve sold off or run down our public utilities and the necessary expertise. There are plenty of things which have long been thought of as natural monopolies, but they’ve been turned into a patchwork free market mess. I look forward to Geoff’s posts. They are topical, fresh and packed full of real numbers instead of wild assumptions or motherhood statements. This one is no different. I could wish that it goes viral, but facts are boring. That this is so is a sign that critical thinking and practical application of knowledge are valued less highly in today’s world than are, for example, opinion polls, a.k.a. beauty contests. Yet polls and big money seem to drive public policy. @singletonengineer: Thanks for the kind words. Yes, I like numbers but remember a conversation with a journalist quite some years ago … I asked why a letter I wrote had been cut. He told me that while he considered himself numerate, many others weren’t and that complicated concepts like “standard deviation” just put people off. Fair enough I thought, and they’d done a good job with the cut. And then he asked: “and what does standard deviation mean anyway?”. … [jaw hits floor] I explained slowly and never forgot the exchange! So I try to use the simplest mechanisms I can to make a case. BNC has plenty of readers with deeper knowledge of its topics than me, but I try to write for the newbies. Price signals to change behaviour. Sure, I’ve heard that can work with a bunch of things. I would argue that direct usage of energy, with electricity being the most valued form, is different enough in how fundamentally it underlies probably every other modern pursuit, that applying the the price signal cudgel is naive. Some of the decrease in fuel oil could be caused by railroads using #6 oil [tar] as fuel. #6 fuel oil requires a 60:1 compression ratio and a slow turning engine, but it works. I was party to the downturn in fuel oil consumption. At that time (early 1980s) I had a laboratory in a factory with several large kilns running on heavy fuel oil. The stuff was a “bottom fraction” from the local refinery, sulphurous and so viscous it had to be heated in winter to get it to flow. But it was cheap. That changed when the HFO came into demand by the refineries themselves. As I remember it, once the oil shock persuaded consumers to pay a higher price for their petrol/gasoline and diesel, it became profitable for the fuel refineries to crack the HFO. Increasingly strict environmental controls on sulphur content were increasing its processing costs and reducing its consumer base too. We shifted from HFO to powdered coal and sawdust, and eventually to “natural” gas. Hi Roger. IEA has some great free graphs. The actual datasets tend to cost big bucks, but some things are pretty obvious without needing too much detail. Annoyingly, they’ve dropped g-co2/kwh from their latest “CO2 emissions from combustion” report but they have something even better … stay tuned!